More information to improve this page appreciated. Born in Paris, France to a father who loved motor sports and was employed as the motoring correspondent for the Petit Parisien newspaper, Jean-Pierre Wimille developed a fascination with racing cars at a young age. He was 22 years old when he made his Grand Prix debut, driving a Bugatti 37A at the 1930 French Grand Prix in Pau. Driving a Bugatti T51, in 1932 he won the La Turbie hill climb, the Grand Prix de Lorraine and the Grand Prix d’Oran. In 1934 he was the victor at the Algerian Grand Prix in Algiers driving a Bugatti T59 and in January 1936 he finished second in the South African Grand Prix held at the Prince George Circuit in East London, South Africa then won the French Grand Prix in his home country. Still in France, that same year he won the Deauville Grand Prix, a race held on the city’s streets. Wimille won in his Bugatti T59 in an accident-marred race that killed drivers Raymond Chambost and Marcel Lehoux in separate incidents. Of the 16 cars that started the race, only three managed to finish. 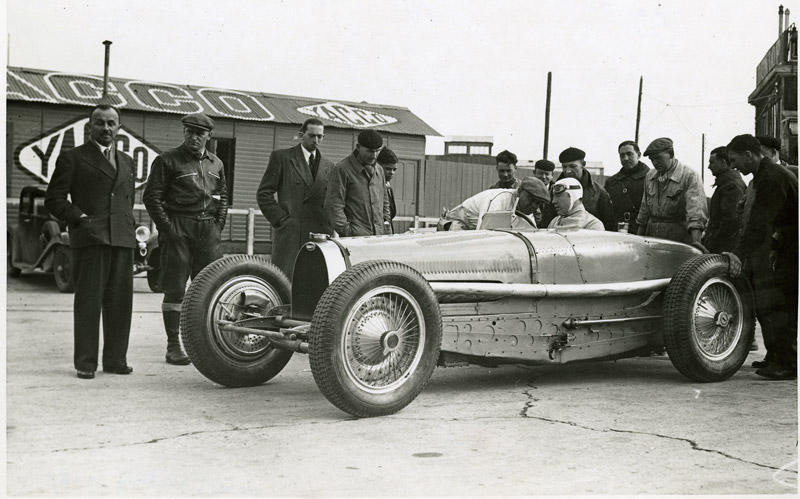 In 1936, Wimille traveled to Long Island, New York to compete in the Vanderbilt Cup where he finished 2nd, behind the winner, Tazio Nuvolari. He also competed in the 24 hours of Le Mans endurance race, winning in 1937 and again in 1939. When World War II came, following the Nazi occupation Wimille and fellow Grand Prix race drivers Robert Benoist and William Grover-Williams joined the Special Operations Executive, which aided the French Resistance. Of the three, Wimille was the only one to survive. Jean-Pierre Wimille married Christiane de la Fressange with whom he had a son, François born in 1946. At the end of the War, he became the No. 1 driver for the Alfa Romeo team between 1946 and 1948, winning several Grand Prix races including his second French Grand Prix. From 1946 on, Wimille built and designed cars in Paris under the brand-name Wimille. Between 1946 and 1950 around eight cars were built, at first with Citroën-engines, later with Ford V8-engines. Jean-Pierre Wimille died at the wheel of Simca-Gordini during practice runs for the 1949 Buenos Aires Grand Prix He is buried in the Cimetière de Passy in Paris. There is a memorial to him at the Porte Dauphine on the edge of the Bois de Boulogne in Paris.